North Carolina's HB2 was, and is, the imposition of conservative Christianity on the entire population of the state. The National Collegiate Athletic Association gave North Carolina a deadline of Thursday to repeal HB2 or be shut out from hosting post-season games. At the same time, the Associated Press determined that North Carolina was going to lose $3.76 billion because of HB2. Governor Cooper and the Republican-controlled state legislature worked out a “compromise” bill. They removed birth certificate requirements from the law but left in place the prohibition of transgender people using gender-appropriate facilities — a provision directed at the state's most fragile citizens, gender nonconforming children. More than the segregation, the compromise continues to perpetuate the false idea that transgender people pose a threat to others. The law continues to ban municipal nondiscrimination ordinances until 2020. At that time I am reasonably certain that the good Christians who dominate the legislature will pass a new law to preempt nondiscrimination ordinances by political subdivisions. This so-called compromise might serve Governor Cooper's political needs. 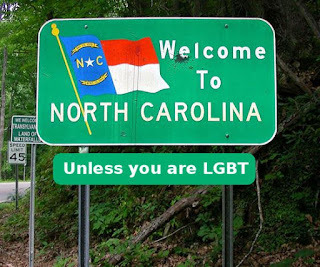 However it does nothing to serve the needs of North Carolina's LGBT citizens. It most certainly should be rejected as a solution by the NCAA.